Our non-vibrating systems for the processing of suspensions. SIEBTECHNIK curved-screen systems (type ZB or ZBB) are dynamic dewatering and classifying screens, even though they contain no mechanically moved parts. The system consists of a stationary housing that is fitted with a concave-curved screen cloth. The systems have been specially developed for the separation of solid materials from process or waste water and achieve optimum results at a low cost. Material is fed pressurelessly either by static height or by external sludge pump. The suspension is fed into the feed chamber so as to ensure even charging over the entire width of the curved screen. The screen cloth slot apertures running across the direction of transport separate the liquid from the solids. Solids that are smaller than half slot width pass with the water into the underflow, so classifying the materials. 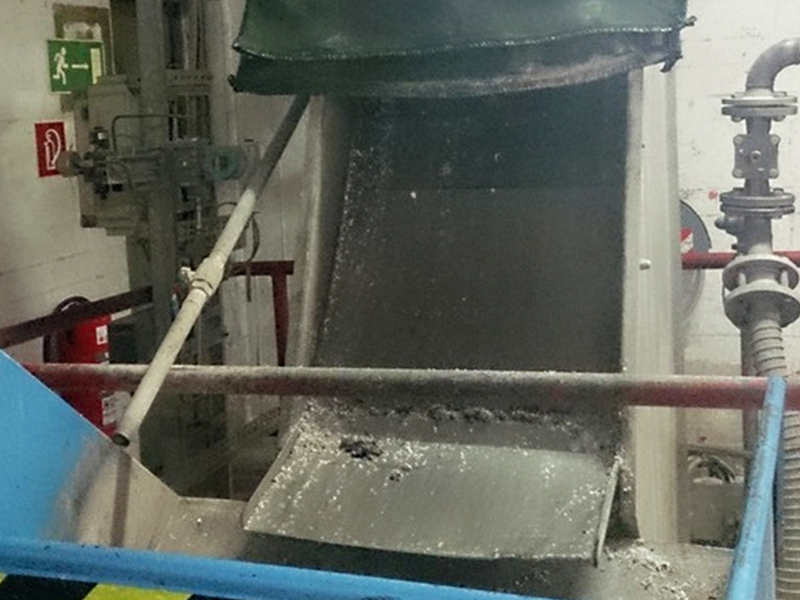 The dewatered solid is discharged at the end of the curved screen. Curved screen systems and screen cloths are mostly manufactured from 1.4301 material but can, if required, also be manufactured from 1.4571 material. The profiled bars of the slotted screen are arranged parallel to the curved screen level. These screen cloths can be easily replaced and are selected with regard to slot width (from 0.05 to 2 mm), depending on the requirement. Because of an identical radius of curvature and identical screen length the screen cloths can be turned over and so used for longer. 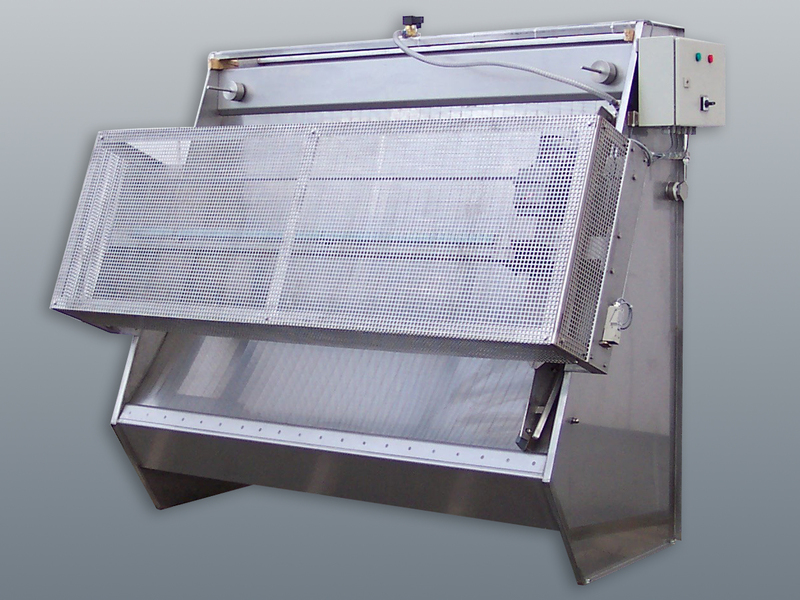 For feeding the suspension to be dewatered or classified the unit is provided with an infeed housing. A collecting box with supports at the bottom of the housing serves to drain off the screened-out matter, while the dewatered solids fall off automatically across the entire width at the end of the screen cloth. Normally curved screens are operated pressurelessly or material is gravity-fed to them. 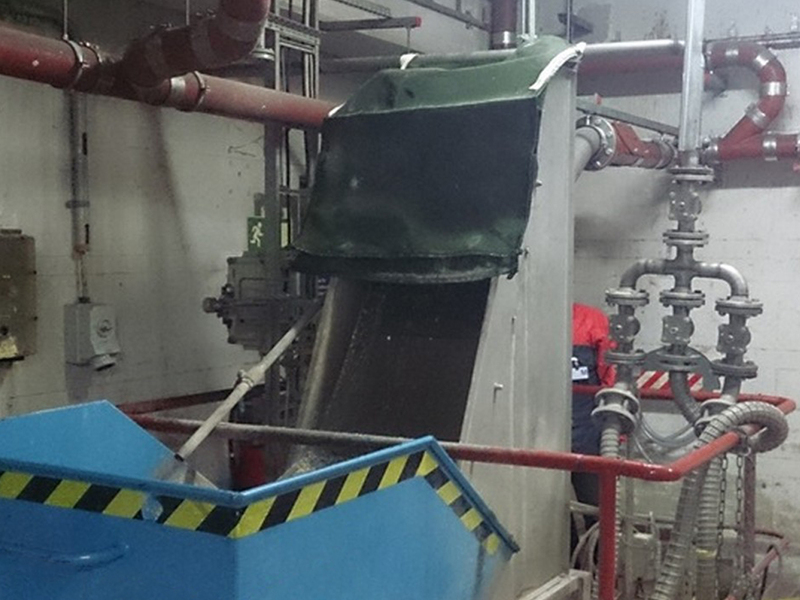 In pressureless operation the infeed housing is provided with overflow weirs or slotted nozzles for feeding. An intrinsically elastic flap enables automatic quantity regulation in the easiest possible way. In special cases (for example, with high suspension viscosity) versions with a pressure housing are used, with slot or round nozzles being used for suspension feed. Because of the special way it operates the curved-screen system is a universally applicable classifying and dewatering unit. It may therefore be used in virtually any industrial branch. For pre-thickening of suspensions of all kinds the curved screen is an extremely economical preliminary stage to centrifuges and driers. Considerably savings potential is created by the removal of crystalline or fibrous solids from operating or waste water or for the retrieval of recyclable materials from watery media. Depending on the feed equipment, the suspension fed to the curved screen is conducted in a tangential stream to the upper part of the curved screen cloth via a weir or by means of nozzles. When the screen cloth is flowed over, the boundary layer of the flow band is deflected by the resulting angle of impact between the profile bars and so passes through the slot holes. If the slot width is selected so that solids (fine fraction) can also pass through with the liquid, classification results. A quantitative separation or dewatering of the solids results, on the other hand, if the smallest solid particle in the suspension is greater than the separating size obtained by the choice of slot width for the screen. The most extensively dewatered solids or coarse fraction are or is discharged automatically by the constant afterflow of material at the end of the screen cloth. The constant overflow at a relatively high flow speed in conjunction with the arising shearing-off of the boundary layer creates a high self-cleaning effect, so preventing screens from clogging. Wear on the screen is very low, as the boundary layer of the flow band acts as a liquid film to counteract wear. For classification work the slot width on the screen can be selected considerably larger (many times as large) than the desired separating size, as a result of which a high throughput, low grain mismatch discharge and an always clear and open screen area are equally guaranteed. SIEBTECHNIK curved-screen systems can be optionally fitted with an automatic cleaning device. This cleaning device moves cleaning brushes parallel to the slot holes over the entire width of the curved screen once every cycle. By adjusting the time-controlled spindle drive for the cleaning brushes optimum clearance of the curved screen is maintained. 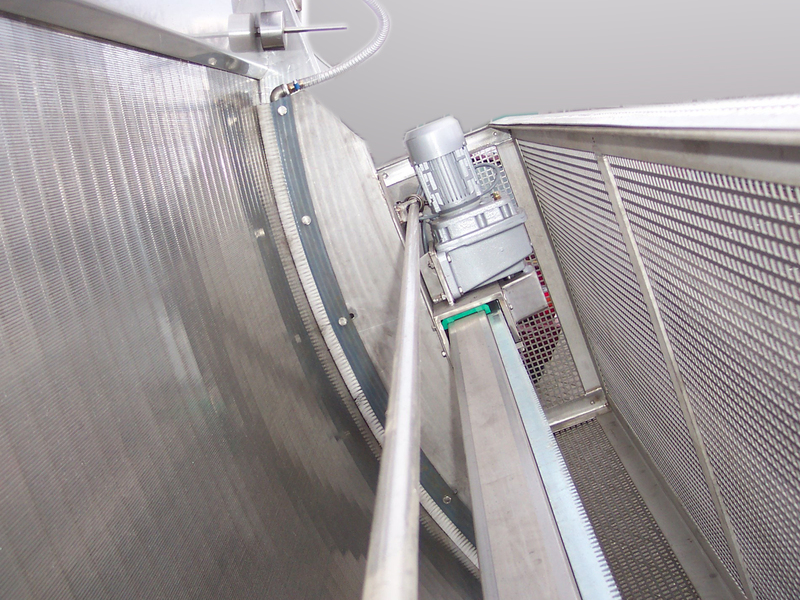 The cleaning device can also be extended to include a spraying system for the removal of grease. A switch cabinet fitted with the required control equipment completes our delivery. High throughput, which even in continuous operation remains unchanged because of the self-cleaning action or a cleaning device. High separating accuracy because of the non-dependence on the specific weight of the solids and the solution – unlike with flow classification. Low installation costs thanks to small space requirement because of the compact construction combined with a high specific performance. Low running costs thanks to low-maintenance operation through the non-use of mechanically moved parts.